Cell and tissue transplantation is one of the most exciting and rapidly expanding areas in medicine. 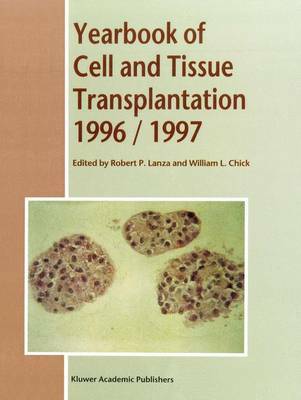 This first edition of the Yearbook of Cell and Tissue Transplantation summarizes the latest advances in this revolutionary field, including developments in tissue engineering and transplantation of hybrid organs and tissues, while reviewing those data which, while not new, add to the usefulness of this work as a comprehensive reference. The justification for yearbooks is greater than ever as we approach the third millennium, overwhelmed with information. In view of the important and rapid changes occurring in this area, a new edition of this yearbook will appear periodically. The editors' careers at Harvard Medical School guarantee the quality of this book. The authors, too, are uniformly drawn from the highest rank of an unusually dedicated and heterogeneous professional group.